I'm so pleased to announce the recent launch of Lily’s Secret, in celebration of The Feast of the Holy Family. Author, Cindy Tingley's first children's book tells the story of Mary and Joseph’s journey to Bethlehem, a little differently than usual. 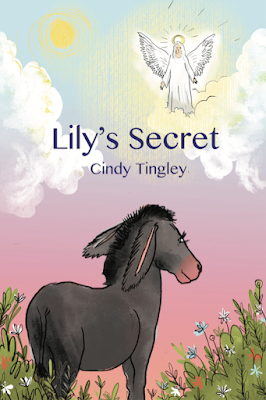 Lily’s Secret is the first in a series of children’s bible stories told from the perspective of Lily, the pint-sized donkey who carries Mary, heavy with child, to the manger where Jesus is born. Lily’s Secret is the story of a little donkey named Lily, who has a secret. One day Lily is visited by an angel, who tells her of a child, a Saviour, who will be born, and Lily is the one chosen to take his mother, Mary, and her husband, Joseph, to Bethlehem. Lily is frightened because she’s been told she’s too little to do anything important. She draws strength from her faith and overcomes her fears and self-doubt, to safely carry Mary and Jesus, the unborn child, to their destination, and beyond. Lily’s Secret was first written almost 10 years ago but Tingley felt the timing was right to re-launch a revised edition of the book in preparation for her series. “I hope Lily teaches people that no matter what the circumstance, no matter what life is throwing at you, no matter how small you are or how impossible it seems, things can always work out,” said Tingley. Lily’s Secret is available now on Amazon and Barnes & Noble or can be ordered through local retail bookstores. For more information on OC Publishing visit www.ocpublishing.ca.